Over this last past weekend, my family and I attended the Barnstable County Fair in Falmouth, MA. 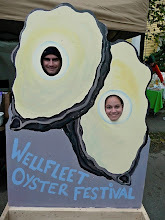 In the food court section of the fair, among all the greasy fried dough and hot dog vendors, was a well-managed booth exhibit by Pirate Shellfish, proudly displaying, and of course selling, Wellfleet Oysters. The shop keeper – Clint Austin – had his own oysters for sale at a more than reasonable $1 each. At first glance, I could not bring myself to eat oysters at a county fair, however after checking it out, I found this booth to be well run, clean, organized and strict – all oysters were on ice and temperature gauges were everywhere to ensure quality control. I started with 3, which led to another 3 which quickly led a dozen – the oysters were fresh, delicious and had that classic ocean fresh oyster taste. It was a great experience all the way around. The booth offered all the fixings and trimmings – lemon, Tabasco, horseradish and cocktail sauce so you could dress to your liking. Clint knew his goods, knew what he was doing and offered a crushed shell-free shuck. Here is a link to their site if you are interested in checking them out on the web. All in all, I give the experience, and of course the oysters, a 10 out of 10. Good stuff.